Since University Challenge returned to New Zealand screens in 2014, UC has not finished lower than 2nd and have won twice. Now we’re looking for the next team to continue this impressive run! Do you think you have what it takes? Come along to the Info and Preliminary Quiz Night, Thursday 17 May, 6pm at LAWS108. If you’re a genius at general knowledge, everyone wants you on their team for pub quizzes, you know your Shakespeare inside out, or maybe you’ve just got lightning fast reflexes, we want you! You don’t need any quizzing experience, and the team is open to all students, from first-year to postgrad. As part of the team you’ll be training with other like-minded people, before taking it to the other universities. Make this year your year, be part of a once in a lifetime, unforgettable experience. 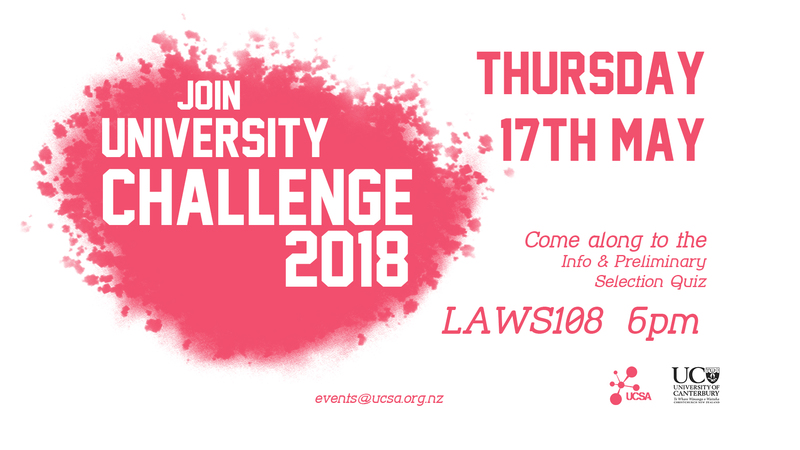 Any questions, please contact events@ucsa.org.nz. 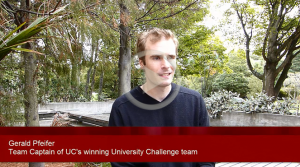 University Challenge, do you want to continue UC’s success? 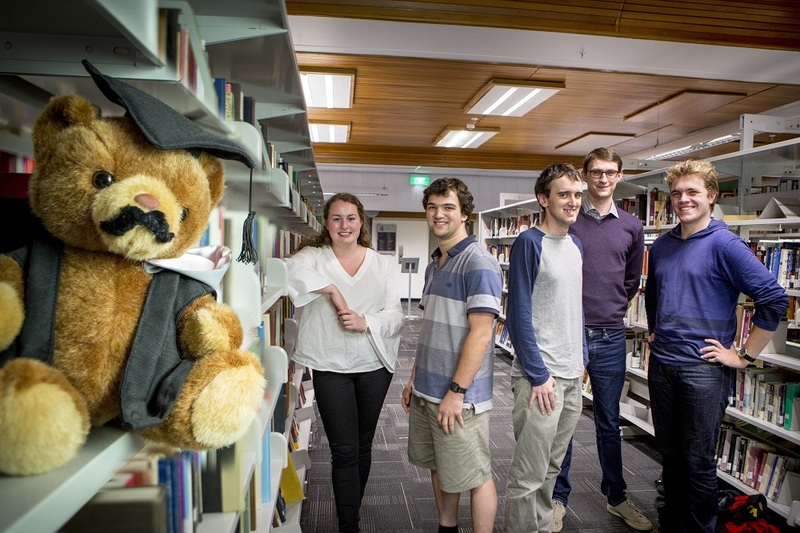 Last year’s UC team won New Zealand academia’s top trivia quiz show, University Challenge for the second year since the show returned to New Zealand screens in 2014. Team captain Stewart Alexander, Liam Boardman, Catherine O’Donnell-Jackways, Alexander Amies and Jack Hayes won by a convincing 210 – 90 over the University of Waikato team in the final. We want to continue the trend this year, by sending our best team to compete. Do you think you have what it takes? 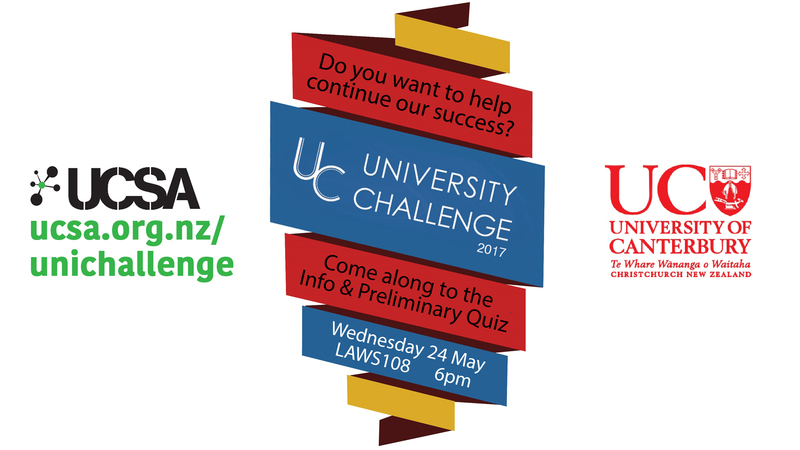 Come along to the Info and Preliminary Quiz Night, Wednesday 24 May, 6pm at LAWS108. If you’re a genius at general knowledge, everyone wants you on their team for pub quizzes, you know your Shakespeare inside out, or maybe you’ve just got lightning fast reflexes, we want you! You don’t need any quizzing experience, and the team is open to all students, from first year to postgrad. As part of the team you’ll be training with other like-minded people, before taking it to the other Universities in the filmed competition. Flights, food, and accommodation will all be paid for! Make this year your year, become apart of a once in a lifetime, unforgettable experience. Check out the Uni Challenge Facebook page, see last year’s team, watch some short videos and read about our success. UC’s winning 2016 University Challenge team. UC take out University Challenge! You may have seen on Prime last Saturday the final episode of the 2015 University Challenge series…which we won! The show had not run in New Zealand since 1989, so after a 25-year hiatus it’s pretty awesome to have UC take out the win. Our team featured Gerald Pfeifer as the captain as well as Daniel Redmond, Rachael Harris, Stewart Alexander and Liam Boardman. Together they travelled to Invercargill last winter break to film the series over a week. They were sworn to secrecy about the result of the show for nine months until screening! The UC team faced a real challenge against Victoria University in the semi-final, but used their speed on the buzzers to knock them out. When it came to the final against Auckland University we were on a roll, and in the final minutes secured the crucial points to win the series. I caught up with Gerald to see what it was like being on TV, and what was involved behind the scenes. Make sure you click on the video above to hear what it felt like to win the series! If you didn’t catch the series on TV, you can watch online here with your Sky Go login. Click here to read more about the win and Canterbury’s history on the show.